On-Hold Plus: award-winning telephone music-on-hold products for every size business! On-Hold Plus manufactures a full line of innovative on-hold audio solutions for small offices, home offices, and larger sized enterprises. On-Hold Plus offers a complete line of telephone music-on-hold software and hardware products which allow any business. regardless of its size, to present a professional image. The critically acclaimed OHP 6000 MP3 digital on-hold audio system, along with its MessageStudio software, allows you to create your own custom on-hold audio with a few mouse clicks. And with the OHP 6500 models, now even small offices and home offices can have on-hold audio on ordinary analog or KSU-less phones. In addition, On-Hold Plus also has a full line of critically acclaimed software products including the MessageStudio production software. It used to be that only businesses with PBX or KEY phone systems could have on-hold audio. Not anymore! The new OHP has an integrated analog adapter module which allows it to provide on-hold audio content to ordinary analog and popular "KSU-Less" phone systems. The module is a landmark achievement that allows millions of businesses without PBX or KEY systems to have on-hold audio for the first time, ever. The OHP works with virtually all analog and KSU-less phones and is activated by pressing the hold button on any phone extension. The module supports up to four incoming lines and provides on-hold audio on up to 50 phone extensions. With the OHP any business, regardless of size, can sound like a corporate giant. Whether you want the flexibility to create your own, professional sounding on-hold audio at a moment's notice, or if you want a professionally produced message production e-mailed to you the new OHP-6000 is the ultimate solution! Winner of the prestigious Best of Innovations Award honors at the 2004 International Consumer Electronics Show in Las Vegas, the OHP-6000 is, perhaps, one of the most awesome office productivity and image tools ever! Best of all, the player does not need to be connected to a computer in order to play it’s high quality on-hold audio. OHP-6000 Series Digital Players -- Revolutionary digital music-on-hold playback system supports MP3 and WMA audio formats. The unit has 64MB of on board memory preloaded with over 228 minutes of great sounding licensed music content, so it’s ready to go right out of the box. Add new content to the player by connecting to a PC via the USB port or just slip in a Secure Digital (SD) Card with new content. By adding a SD Card you can increase the memory to 1GB. Software With the simple-to-use MessageStudio Software (included) you're just a few mouse clicks away from your own, professional sounding, custom on-hold audio presentation. You'll be surprised at just how quick, fun and easy it is to sound like a Fortune 500 company! 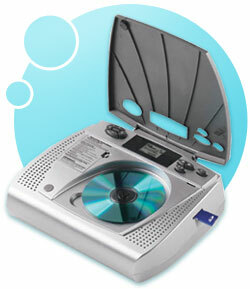 Revolutionary digital music-on-hold playback system supports MP3 and WMA audio formats. The unit has 16mb of on board memory preloaded with over 57 minutes of great sounding licensed music content, so it's ready to go right out of the box. Add new content to the player by connecting to a PC via the USB port or just slip in a SD Card with new content. By adding a 1 GB SD card, you can increase the playback time to over 70 hours! Revolutionary digital music-on-hold playback system supports MP3 and WMA audio formats. The unit has 64mb of on board memory preloaded with other 4 hours of great sounding licensed music content. The OHP 6500 works with virtually all analog and popular KSU-less phones. The 6500 also includes hold music activators that provide "true" hold button activation of your on-hold audio when connected to the handset cord of each phone.